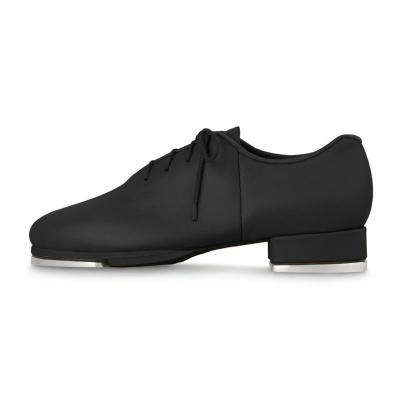 The Sync Tap Shoe from Bloch offers the perfect balance of feel and performance. This Oxford-style shoe is constructed with a comfortable soft leather upper with reinforced eyelets, and a reinforced suede outer sole. The insole is cushioned for shock absorption, and the heel features a notch to relieve pressure on the Achilles tendon. This is a very enjoyable shoe to wear! Performance wise, a pro-balance rubber pad is attached under the ball of the foot behind the toe tap to achieve a non slip sole. And the sound is great - Bloch has developed larger taps for this shoe, using 70% more metal than previous models, providing a powerful result. These “Mega Taps” fit perfectly flush to the toe and heel edges for optimal stability and sound.